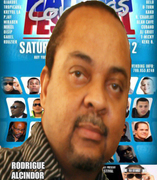 MIAMI COMPASFEST SHOT CALLER RODRIGUE ALCINDOR ON 3 CANDIDATES TO CLOSE THE SHOW + SCOOPS ON NU LOOK. DJAKOUT. TVICE. GAZZMAN DISIP + MORE! *NU LOOK: WHY THEY ARE NOT ON THE LIST OF MIAMI COMPASFEST CLOSERS! *GAZZMAN/GRACIA DELVA BAL SHOWDOWN NEWS!